My daughter has this sink and it is beautiful so I ordered one for myself! Beautiful finish and very durable. Enjoy the advantage of high-end kitchen sinks with the best-selling Standart PRO Series. This KRAUS sink features a clean contemporary design and wear-resistant finish with a beautiful sheen that complements most kitchen appliances. Dimensions 32.75 In. X 19.0 In. X 10.0 In. I bought this sink for my kitchen renovation. I did not look at the sink before it was installed in the granite countertop, so I was shocked to find out that eah bowl is 11 inches deep! That's because it is an undermount sink, and the granite counter is 1 1/4 thick. But, it is a beautiful sink, and we have gotten used to the additional depth of it. We can wash large pan, bowls, etc. and they are all contained in the other side of the sink to drain. I would probably buy a nine in deep sink if I were to do it again because they each side would be 10 1/4 inches deep when you consider the granite, and that would have been deep enough. Still, I do like this well made sink. The best sink ever invented! I bought this sink after seeing it at a friends house. It's 10" depth is fabulous and keeps the sprays off the granite counter and allows for ease of cleaning bigger pots. I love the sink guard racks that come with it. Extra protection for the bottom of the sink. Also, I wasn't sure about the drains being at the rear of the sink, but I find this is better too. The bottom of the pots are no longer covering the sink drains. Exceptional sink. Great sink - make sure it fits your space! I had to return this sink because the person who came to measure for the countertop could not fit the faucet and the sink in the standard counter width. My faucet was a single lever type that has the hot and cold controlled front to back so there was not enough space to move the lever back and forth since it hit my window ledge. This sink is much deeper front-to-back and top-to-bottom than standard sinks. The sink itself was very modern and stylish and well insulated. Since we needed a sink asap for the template the Silestone guy gave me a free sink and I was able to return this one at a cost of $**. We had this sink added to our new remodel of our kithcen with Quartzite counter tops and Kraus 33 inch sink. Sink is of excellent quality and had no problems with pattern or installation. The Kraus sink adds an aire of contemporary look to the kitchen and we like the accessories that came with the sink like the grilles that fit on the bottom of the double sinks so they do not get scatched or scuffed. Highly recommend! 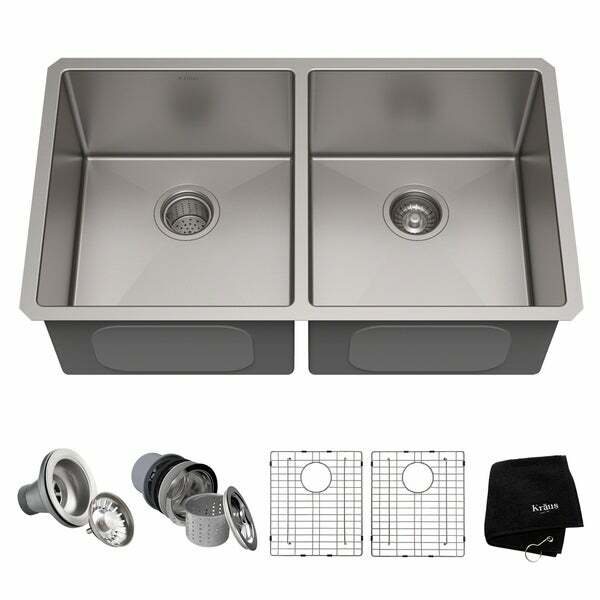 The Kraus sink is really nice, very deep and high quality. We have had it for about a year, and have had no issues. It cleans up well, we use bartender's fiend. The sink does not have any sound issues and has not been overly susceptible to scratches or dings. My wife was happy with the kitchen remodel in general and the sink in particular, and when Momma's happy, the rest of us at least have a shot of being happy. Second time buying this one. This is a deep sink that holds a lot. It's easy to clean, and it is durable. I liked it so much in my kitchen remodel 2 years ago that I bought the same one for my lake home remodel. Great value. Love Kraus products. My granite installer was very impressed with this sink and mentioned he had installed another just like it last week. He also asked if I got it from Overstock.com, like the other person he installed granite for. This is a great sink. Heavy, deep and fits my sink base cabinet perfectly. i would recommend this to others looking for a great modern sink. The extras that came with it were a real bonus. This was the best price on the internet. I didn't know Kraus before I found this sink and took a risk buying it. Returning a sink is never hard, but getting reimbursed for the plumber fees is. Well I am so happy with the sink that I just bought a Kraus faucet to go with it. The sink is sturdy with its thick gauge and well insulated for noise. The bottom racks work well and cleaning it is a breeze. I have a modern home and the near rectangular corners really match well the style of the home. I was a bit worried with the depth thinking it would be too deep, but I have grown used to it very quickly. Great product! I like this sink, but I probably wouldn't get it again. The depth is great. After 5 years it has held up very well. HOWEVER, be aware that this sink is not slanted at all. It is completely flat on the bottom and therefore does not clean easily. If food bits are in the water when it drains, they will be all over the sides and hard to get down the drain. It has grates in the bottoms of both sides (which is quite nice), but I often have to pull them up to push the food from the sides into the disposal. The Kraus company is wonderful. One of the grates started peeling the chrome coating a few months after I got it. They sent me a new one right away. We looked at many sinks but, for the price, Kraus is the one we choose. So glad we did - it is elegantly beautiful! The Kraus packaging protected the sink and shows pride in their workmanship. It gleams in my new kitchen remodel and competes with the granite as one of my favorite features. Would definitely purchase again. I loved this so much, I bought another one for our summer house!! Great sink! quiet and durable!! This sink looks great and is deep for people who like to put the dirty dishes in the sink after cooking and not have to look at them until after dinner. I've had it 2 years and still looks almost new. Nice deep stainless steel sink. Can hold a lot of dishes. However it is not the best quality. It scratches and gets dirty very easily. Defenetly needs the grates on the bottom so prevent dishes from scratching it. Love it! Have had it 8 years and it still looks brand new. Kitchen designer could not believe how little I paid for a Kraus stainless steel sink. I would definitely recommend. It is deep and has clean lines, my plumber thought I'd paid up to $1000 for this sink. Under mount stainless steel is fantastic! We received a not completely squared sink, but this was the only flaw with the item; otherwise, it functions as expected and looks fantastic! The drains are situated to allow proper drainage, it is easy to clean, the sinks are deep to help prevent splashing and to hold more items. I would recommend this item to anyone wanting a deep stainless steel sink. I highly recommend it! It's efficient and well designed. This sink is beautiful and comes with all the attachments and saves you lots of money!!! Great look and value!!! Love this sink! Always get complements from my family and friends. Great purchase! Arrived packaged nicely but have not put it in yet. Look ok to me. "Does this sink come with a garbage disposal flange?" "My new sink was just installed and it's amazing! I want to purchase kraus accessories such as the drain mat. I have the standard pro double sink, 33, 16 gauge, undermount. What do you recommend? Thanks"
"The sink appears to come with two different styles of drains - one with the basket and one without the basket. Would I be able to get two of the basket style instead of one of each? Or is there a way to order an additional basket style drain?" "The advertised colanders don't seem to exactly match the Kraus sink that I have just bought. As I am ordering online and to ensure I don't end up with the wrong colander, would you please advise which size matches the Kraus Sink Model Number KHU102-33 (size 14 7/8 x 17 inches)"
Hello martin, for the KHU102-33 kitchen sink, the compatible colander would be the model# CS-3 and it has an overall length of 18.5'' and an overall width of 9.5''. This model is compatible with both bowls. I hope this helps. Have a great day! "Are there other accessories available for this sink - in particular, full size and half size colanders? Also, crockery drainers, cutting boards and waste bins that fit into the bowl." Hello martin, accessories are not included with this item. However, there is a great selection that will work we well with this item. The inner bowl dimensions are approximately 14 7/8" x 17". Please feel free to contact us again with any further questions. Thank you for shopping with us! I like my other Kraus purchases. Many very positive reviews(170+ from various sites). Price from Overstock. "What is meant by number of holes? It says 2. I did not think this sink made a difference to the holes required in the countertop. Please explain." Hi tarrynb, The number of holes refers to the drains of the sink. Thank you for shopping with us.